The true Phal. aphrodite var. formosanum from Taiwan, often confused and mislabeled as Phal. amabilis. 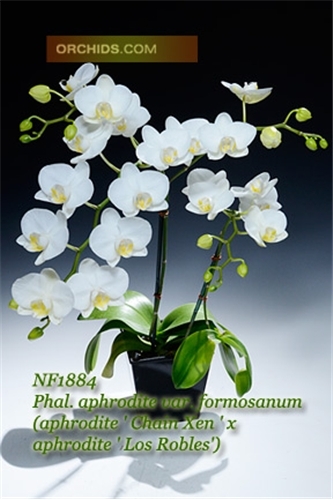 This hybrid population combines two of the best Phal. aphrodite parents to produce the next greatly improved generation of progeny. The variety formosanum tends to produce more compact spikes on an equally compact leaf span. For the true species collector, this is a must ! Very Highly Recommended !